This rendering, included in a Cushman & Wakefield digital brochure, shows the exterior of the Boulder29 project. BOULDER — Big changes could be around the corner for the Macy’s department store on 29th Street in Boulder. During the Boulder Valley Real Estate Conference held Thursday in Boulder, several panelists mentioned plans to redevelop the store into office space. 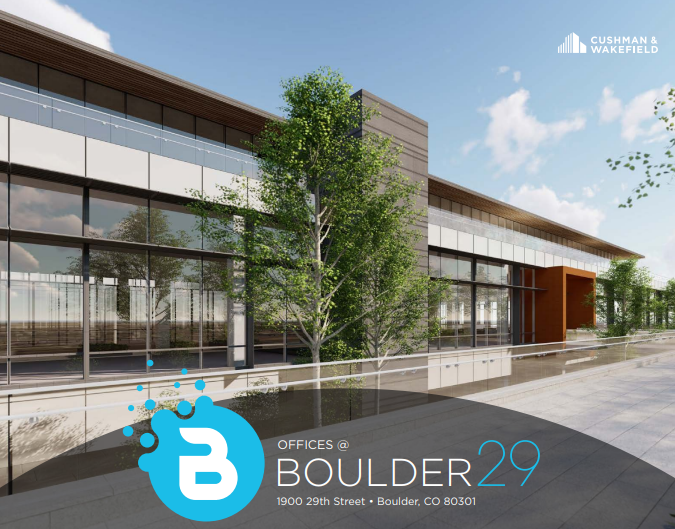 The project, called Boulder29, could include 150,000 square feet of contiguous class A office space, according to a digital brochure from real estate service firm Cushman & Wakefield Inc. (NYSE: CWK). 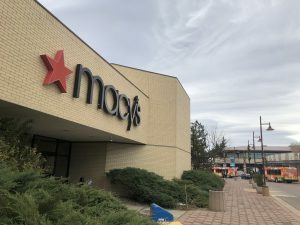 The brochure describes the project site as “repurposed infill,” which suggests the office space could be built out of the existing Macy’s structure rather than demolishing the store and rebuilding. Boulder29 could be three stories with 17-foot ceiling heights, according to the brochure, which does not mention Macy’s by name. The first and second floors could have 62,500 square feet of floor space, and the third could have 25,000 square feet. The project could include 570 parking spaces, rooftop decks, collaboration spaces, a courtyard and a fitness center. The timetable for the potential Macy’s closure and redevelopment is unclear. The Macy’s department store in Boulder, seen in the photo taken Nov. 16, could be redeveloped into office space. Cushman & Wakefield officials referred questions about Boulder29 to Macy’s representatives, who did not immediately provide a comment. Calls to Macerich (NYSE: MAC), which manages the Twenty Ninth Street commercial area, were not immediately returned, nor were calls to Corum Real Estate Group, which is listed on the brochure as the project’s developer. Boulder County public records show the 36-year-old building at 1900 29th St. is still owned by Macy’s. Development plans have yet to be submitted to the city. In 2016, Macy’s Inc. (NYSE: M) announced plans to close about 100 stores over a period of a few years. Dozens of those locations have been disclosed by the company, but none of the stores in the Boulder Valley or Northern Colorado have been included on the closure lists. Macy’s has stores in Boulder, Loveland, Broomfield and Fort Collins. Former Macy’s stores across the country are being redeveloped, some into office space, according to media reports. In locations, including Brooklyn, Chicago and Seattle, where Macy’s had multi-story buildings in downtown areas, the company has sold off upper floors to be turned into offices.